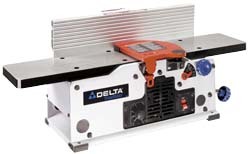 The Delta 6" bench top jointer. As I mentioned with regards to the thickness planner, having that and this jointer really make woodworking alot more productive and enjoyable. This is a great unit and surprisingly powerful given it's size. The speed control is an interesting option but I haven't really found a use or reason to slow down the blade. Perhaps you would use it for acrylic or plastic so you wouldn't melt it.